684/365 - Motion Control in Middle Earth? 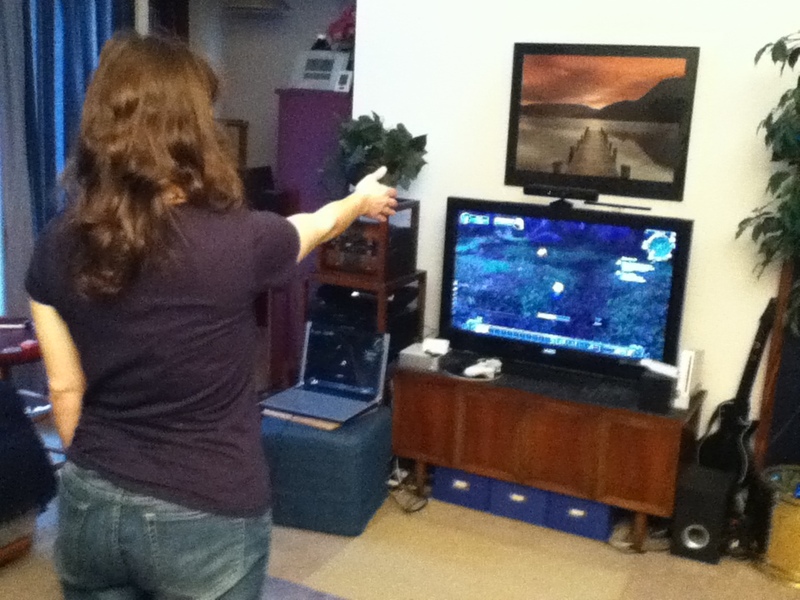 So part of the evening I worked on getting the Kinect and Lord of the Rings Online to work together. 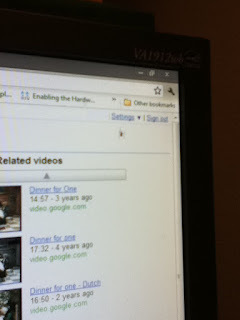 I didn't take and photos but I did take a screenshot for keybinding reference. More work this week. Hope to have a post up on Casual Stroll to Mordor in the next week or so after I get some kinks worked out. 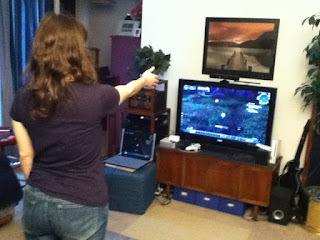 This afternoon I decided to hook up the Kinect to my laptop and try getting an MMO working with it. Lord of the Rings Online (LOTRO was having some server issues so I snagged the keybindings from FAAST's forums and booted up World of Warcraft (WoW). The bindings are very basic - just an introduction. I plan on elaborating on them over the next week or so and trying both WoW again as well as LOTRO. I also need to figure out how to capture video with both the video game and the FAAST software (so far I've only managed to capture one or the other). It does add a whole new level of game-play and I'm excited to play with the Kinect some more. 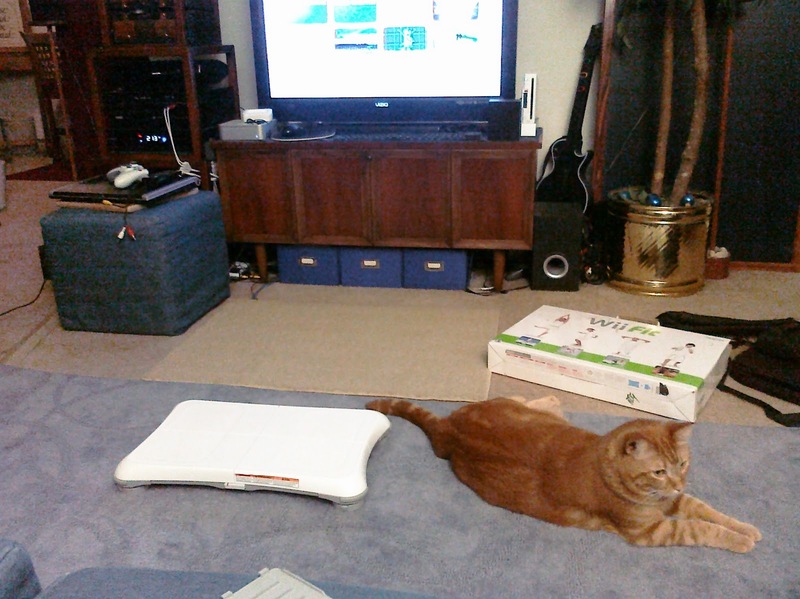 With the newly open living room space, I decided to try the Wii Fit again. It was sure to let me know I've been absent for a year and a half. Oops. Chris has been on the hunt for a replacement rug for as long as I can remember. Today a replacement rug was finally procured! 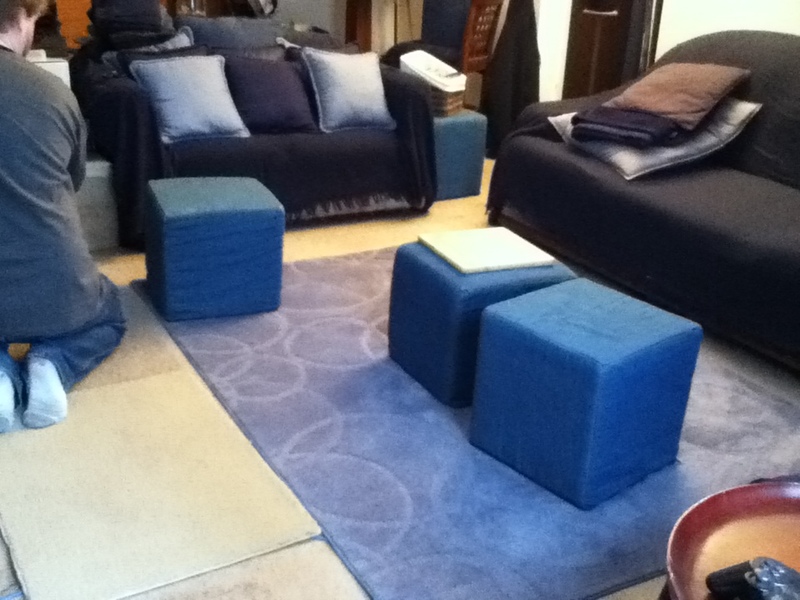 Chris also re-arranged the living room to be more Kinect friendly (which meant temporarily removing the coffee table). Leki is a big fan of the change. He loves new stuff - whether it is open floorspace or new toys - both of which he received today. 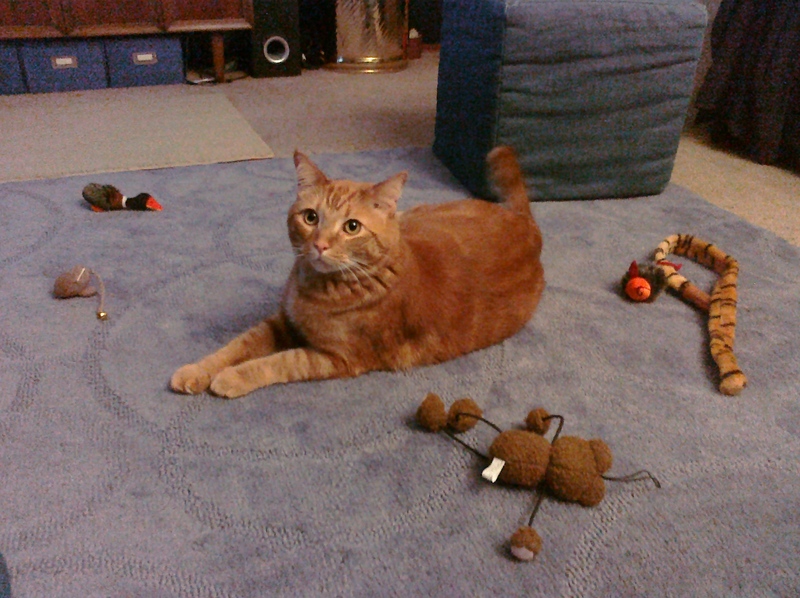 Chris had several cat toys that Leki took an immediate liking to. As for me, I spent several hours bouncing between twitter, the Guardian's live blog, and live streaming coverage of Egypt by Al Jazeera. There are several journalists on the ground live-tweeting the goings on in Cairo and elsewhere. 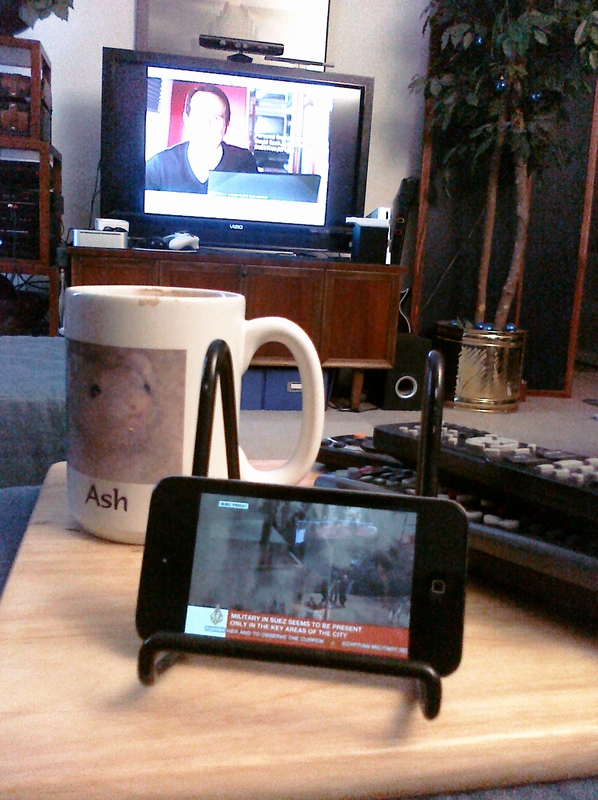 As you can see from the picture above, I opted to switch from cable TV news coverage to more in-depth live streaming on my iPod touch with Al Jazeera's iOS app. It's big news - heck, even Attack of the Show did a short segment on Friday, which is a day they don't air new content. If you haven't heard anything on the goings on in Egypt, I suggest you check out those sources for more information. Also, this article is a good read on why the US doesn't get Al Jazeera - in case you were wondering what the network was or why you might not have ever heard of it before. Ok, enough news and politics. Tomorrow it's back to your regularly scheduled boring daily photo posts! 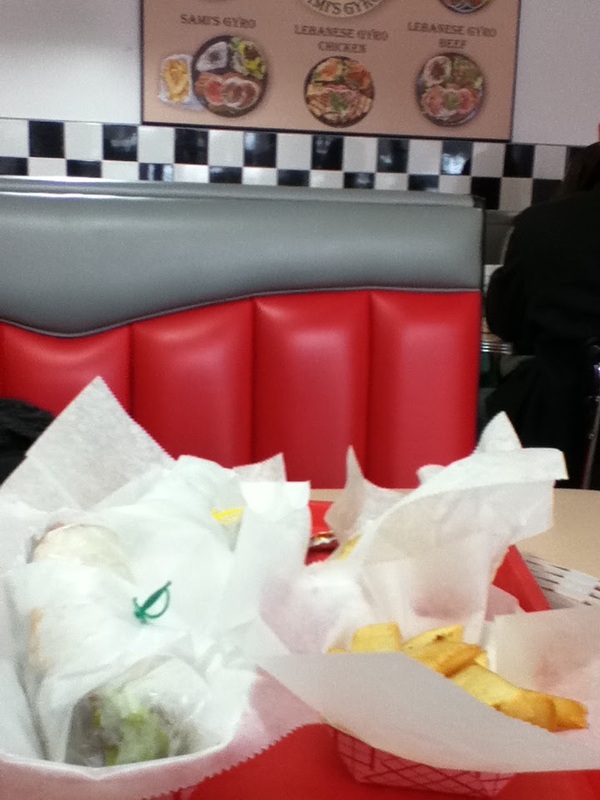 Deliciousness at The Pita House for lunch with Lori! 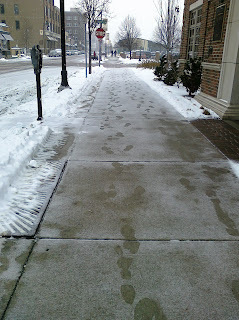 The afternoon was a snowy one. Walking just a few minutes over to the skywalk was chilly and by the time I was done with lunch about an hour later it seemed like there was a good 1/2 inch of accumulation. In the evening Chris & I checked out Champions Online. It's recently gone free to play (F2P) so why not? It has a character creation that is on steroids. You get a lot more granular control than other MMOs such as World of Warcraft, Final Fantasy XI/XIV, Lord of the Rings Online, etc. 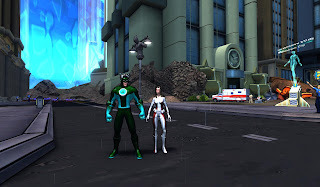 You can manipulate facial structure as well as your superhero outfits as well as accessories. The character creation reminds me sort of like some Bethesda games I've played such as Morrowind or Oblivion (sans superhero spandex, that is). We're still in the intro area so it will be interesting to see what it opens up to. You know your significant other is awesome when you start rambling about a book you had as a child that was awesome and he walks over to his bookshelf and hands his copy to you. So, in the words of Comfort and Adam, he's totally my lobster. 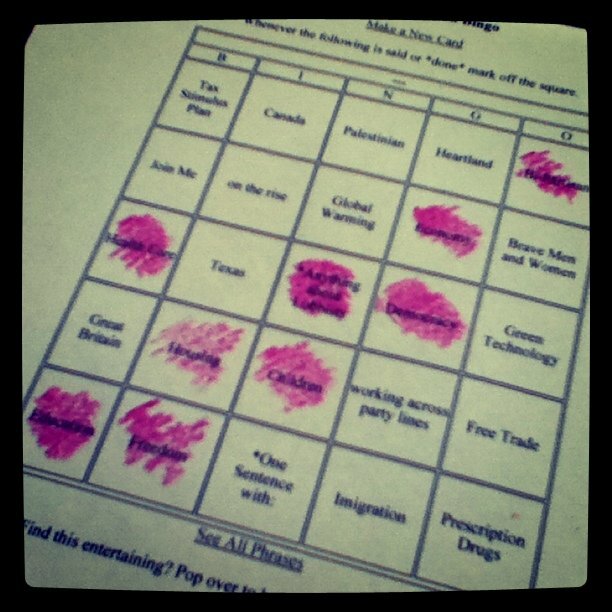 678/365 - State of the Union Bingo! It was a busy Tuesday evening. 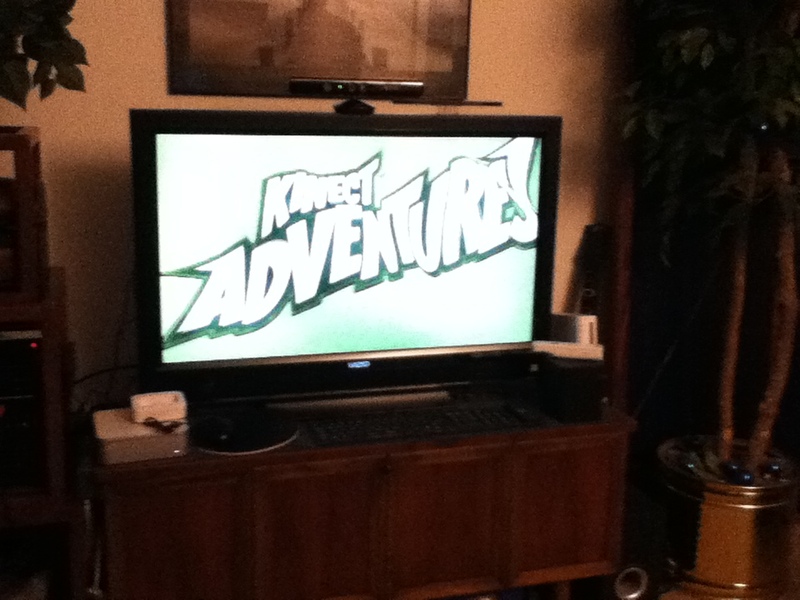 I bounced around in front of the TV playing Kinect. I like playing a few of the sports in Kinect Sports (and I'm not even a sports fan) and, since it's all over Raptr, I can't hide that I've started playing a dance game. I never really got into DDR, but I imagine this is similar but without the board to step on. I'll still only play the if the cat is the only one in the room. 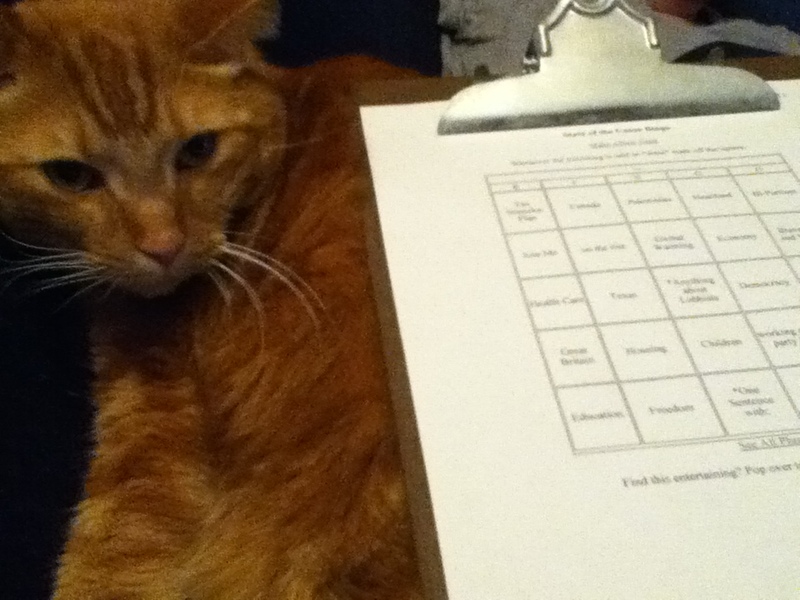 After I was done playing wit the xbox for a few hours (more in the last few days than in the whole time we've owned the thing) Chris and I started to prepare to watch the State of the Union and play SOTU bingo! It was a good few hours with speeches, twitter, bingo, and plenty of snark. As you can see, I won! Even after missing a few items due to distractions from living room discussions and twitter following. I spent a big chunk of the weekend bouncing around in front of the TV playing Kinect games, but the big reason I wanted one was for what you can do with it on the computer. There's a whole host of things out there since the Kinect went on sale, from shadow puppets to street mapping. What caught my interest was the application to desktop games. Specifically - MMOs. 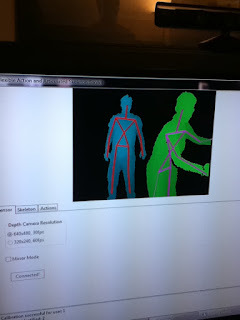 So Chris and I spent about an hour fiddling with the Kinect. If you haven't taken a look at and read the page for the Flexible Action and Articulated Skeleton (FAAST) you should. It's awesome and easy to set up. You can see a lot of potential for this. So first thing after getting everything installed (FAAST, drivers, etc) was to try out hands at minesweeper. It's a little different moving forward and backward to navigate on the board, but it works. Originally we had it so if you jumped you'd click the square, but since we're on the 3rd floor of an apartment this quickly got changed to hand waving. Just add that to the action tab and hit start input emulation! Next up is creating a more robust list of actions for LOTRO. It's been a different kind of day. First off, I slept in. I never sleep in. Even if I stayed up all night I still wake up no later than 7:30 thanks to a cat on a very strict schedule. Not today. Hello nearly 10am. Plus I'm sore, like I did real exercise. 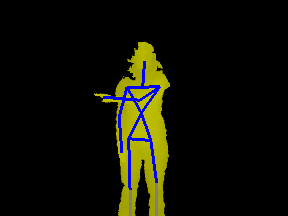 I guess I kind of did yesterday with the Kinect and now my body has a Kinect hangover. Between the two of us we played about three hours of Kinect games yesterday and I've played about an hour again today. Really what this all tells me is that I'm not active enough, which I knew already. I don't like aerobics, dancing, yoga, etc. Toss a video game in the mix though and yeah, you can sell it to me better. Now the real trick is to see how long I stay interested. The only thing I've managed to maintain consistently is walking several miles every day. And that's mostly helped by the fact that I work downtown and walk everywhere. It hasn't snowed much more today, but it's been very chilly out. Squirrels have stopped by a few times looking to see if we've put out any food. Mostly they've been disappointed, but the cat has been entertained by their comings and goings. It's been a quiet day, which is nice for a Sunday. Chris even got to do another epic amount of link blogging today. To me, the Kinect originally sounded interesting, it wasn't until I started hearing about FAAST and possibilities with that (plus Microsoft is going to put out their own official development kit shortly for the computer). Toss in 20% off one-day only coupon and I'm in! So we headed out a little past midnight, figuring since the Kinect is normally hard to find with the coupon it might be even harder. We drove to two different stores but finally at a little past 1am we had a Kinect in hand and were headed back home. Given how crappy the roads ended up being today, I'm glad we opted to shop at midnight as opposed to noon. Now, the long term plan is to use the Kinect more with the computer than the Xbox 360, but that doesn't mean we can't play with some Kinect games, right? So Chris and I played a few games together, and I messed around playing soccer and some other sports games by myself as well. It's very similar to the Wii on a lot of things, but you can't fake movement as easily. With the Wii you can just flip your wrist back and forth - you don't actually have to move your whole body. Not so with the Kinect since it's watching your whole frame. I'm more impressed than I thought I would be. I agree with what Chris has to say about it. 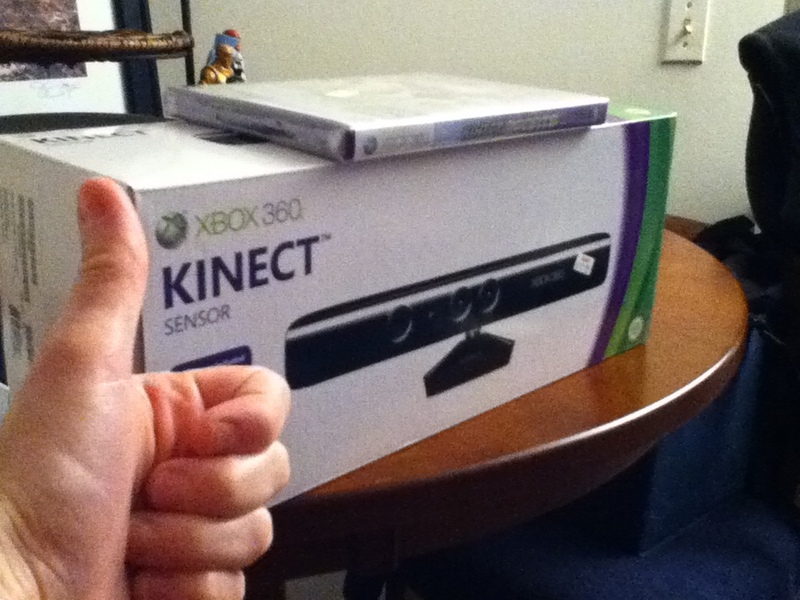 The huge drawback with the Kinect is the amount of room it needs. We don't have a large living room - it's just barely big enough for the kinect after we move the coffee table. Barely. That's ok - we knew that before we bought it. Still, it's a little tricky for both of us to play at the same time. More so than with the Wii. 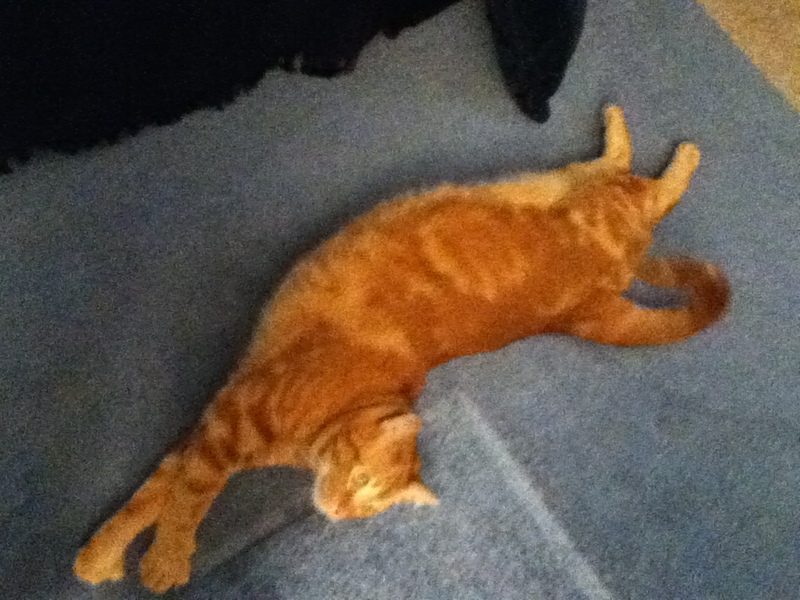 Leki, of course, loves the extra room on the floor. He couldn't stop rolling around in front of us while we played, snagging stray pant legs that got too close to his domain. Tasty lunch with Lori today at The Dog Pit! the iDOS app has found it's way back into the app store, this time without the ability to directly open an .exe file. But, no matter. There's an easy work around discussed at touch arcade that involves the use of iPhone Explorer to load the games onto the iPod/iPhone/iPad instead of iTunes. So i decided to give this a try. I navigated over to http://www.dosgamesarchive.com/ and looked for something I recognized. First game? The Black Cauldron. I remember this game well. I died a lot climbing up the castle wall incorrectly, getting caught in the castle, or in general not doing the right thing. I dont know that I ever beat this game. I'm not exactly sure how old I was when I even got it. I was six when this came out but I dont know if we got it right away. Here's a list of some DOS commands if you're not sure where you are or need a refresher. As for The Black Cauldron - so far it plays fine. You have the option to use a joystick or not (I opt for joystick! didn't have the first time I played this game). One thing that is lacking is the ability to type commands. You can get your commands from the drop down menu in the game, but I was used to typing commands (for example, "look") so it took me a minute. I'd honestly rather play the game on a computer with a full blown keyboard (and the ability to type commands for this particular game) but It's also pretty awesome that I can listen to that cheesy music and run around feeding Hen Wen again. There's more info at the iDOS official forums and in the Touch Arcade forums where some more enthusiastic individuals appear to have gotten Windows 95 running (on their iPads I believe) as well as a host of other games. On the days I head to the library on lunch I cut through the Veterans' Memorial Park. It's a small square of concrete and grass situated between the Children's museum and a church, across from the Grand Rapids Public Library. In the winter I've noticed several times that on various pedestals syrafoam cups are filled with hot chocolate, steaming in protest at the chill air. I'm not sure who puts them there, but i'm sure the people who drink the cups (and judging by the trash bin nearby, the hot chocolate is popular) appreciate the gesture. Kind of reminds me of the trees festooned with free mittens and hats I ran into last year on Cherry street. They were tied to trees last year with messages of "take me" and "free." 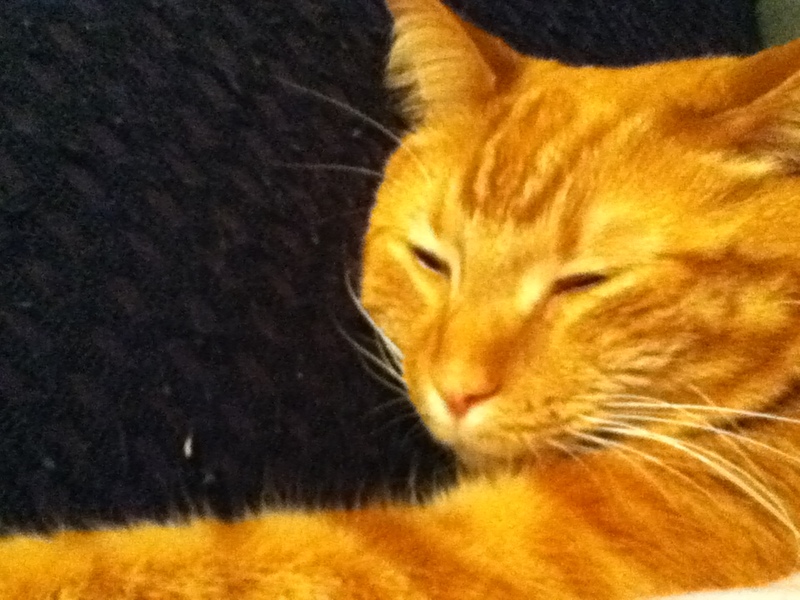 In the evening we watched the State of the State address, to which the cat, as you can see, was engaged. 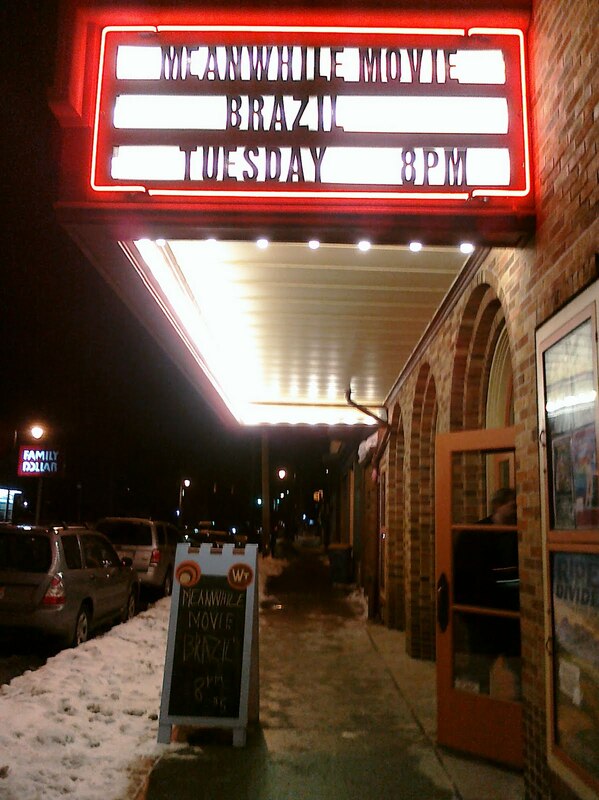 Tonight's Meanwhile movie at the Wealthy Theatre is Brazil. Neither Chris or I have seen it. I'm thinking this is going to be an interesting few hours. I took a late lunch this afternoon, which meant getting caught in the sleet-snow mix the radio had been going nuts about in the morning. It wasn't that bad. Kinda pretty, kinda slushy. Overall, still a good lunch hour for a Monday. It's been awhile since I've used my bread machine to make an actual loaf of bread, so today I set it up for some tasty French bread for dinner. As usual I mangled the loaf until it was just unrecognizable clumps instead of slices of bread. Still it worked out well with the left over pot roast. This evening (yet to come!) we're going to watch The Trashmaster. It's filmed entirely inside of Grand Theft Auto IV and 88 minutes long. Seriously, that is impressive. I'm a fan of other machinima (Red vs Blue, Illegal Danish, Oxhorn) so this is right up my alley. So I've never seen War Games. Yes. I know. I have no excuse. 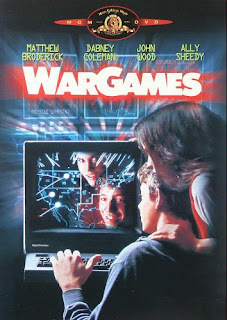 It's a classic movie of computer hacking and I have no reason for not having seen it. I thoroughly enjoyed it, despite Chris having to explain to me what the heck an acoustic coupler was and what war dialing is. The movie held up well enough to me, but maybe that is because I'm so used to other movies of the 80's centered around the Cold War (which I think Canadian Bacon, while a 90's flick, does a good job poking fun at). Anyway, I'm glad to have finally seen it. Outside of that the day was pretty quiet and low key. Chris made a pile of pigs in a blanket for lunch-time snacking. He also made a tasty breakfast and dinner - so all in all the day was a win for me in terms of laziness and relaxing. Three weeks in a row of four day work weeks made this regular five day week so loooooong. We got up to another fresh snowfall, and the drive to work was slow, but honestly not as bad as it looks like it would be from the photograph. The apartment complex where I live is horrible at clearing snow, so it's always worse here than anywhere else I drive. We headed out in the evening to see The Green Hornet and met up with Chris's friend Dave and his girlfriend. Early on neither of us were interested in seeing it, but somewhere along the road Chris changed his mind and so I tagged along. I went in assuming it was going to be crappy, but it was surprisingly amusing. It's an action-comedy film all the way, so expectations of it being comic book like shouldn't be too high. I also am not familiar with the original series, so I can't say that it was a good or bad update to that. We saw it in 2D (because really, does ever film need to be in 3D? seriously...) and it was just fine that way. In fact, the only thing that seemed like it would have been interesting in 3D were the comic book graphics for the ending credits. Anyway, Chris posted a video review which basically sums up my opinion as well. I spent most of the day sitting at my desk...by the time lunch rolled around I was ready to get up on my feet and move around. Rather than heading over to the library to do some ready I thought I'd finally explore the whole skywalk. 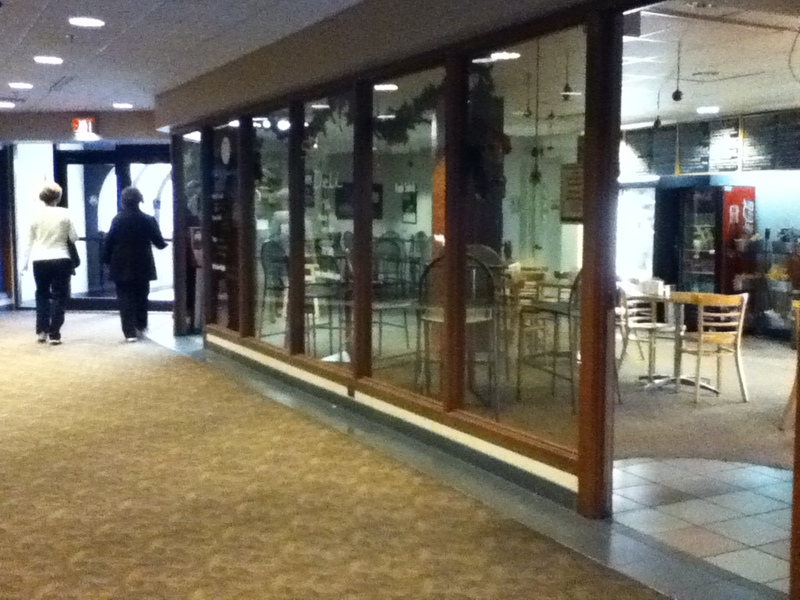 I took several photos throughout the skywalk, though not of every section (like between the Mariott and Skywalk Deli, or between the Van Andel and the building across the street). It's an and each section looks a little different. It's not a very long walk if you're doing it for exercise (under a mile) unless you're walking back and forth from end to end - which I did see several groups of people doing. So here's just a little slideshow, for the sake of a slide show, of the Skywalk. 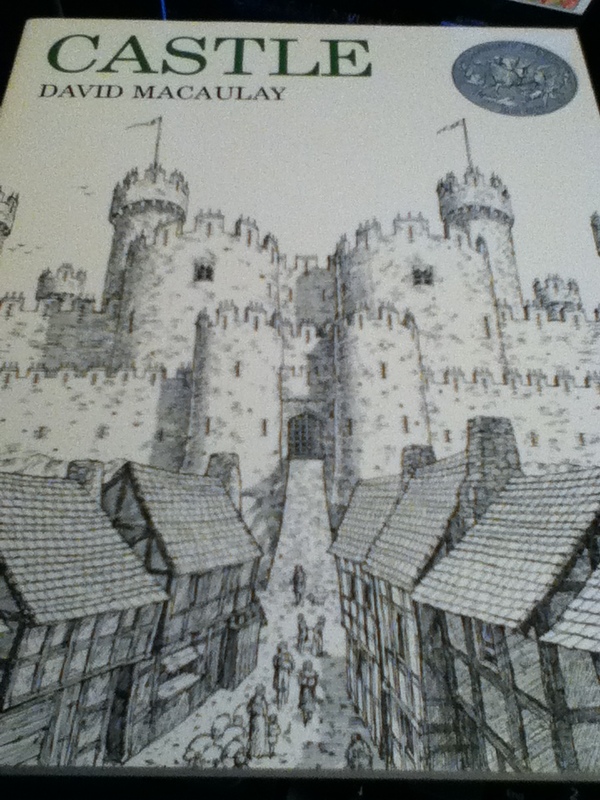 Of course I forgot to take a photo of the maps, so this PDF I found online will have to make do. The slideshow is essentially Devos place working back toward Van Andel Arena. More fresh snowfall today. Made the trip to the library more interesting (dodging puddles of melting snow in the road) and beautiful (fresh coat on everything). 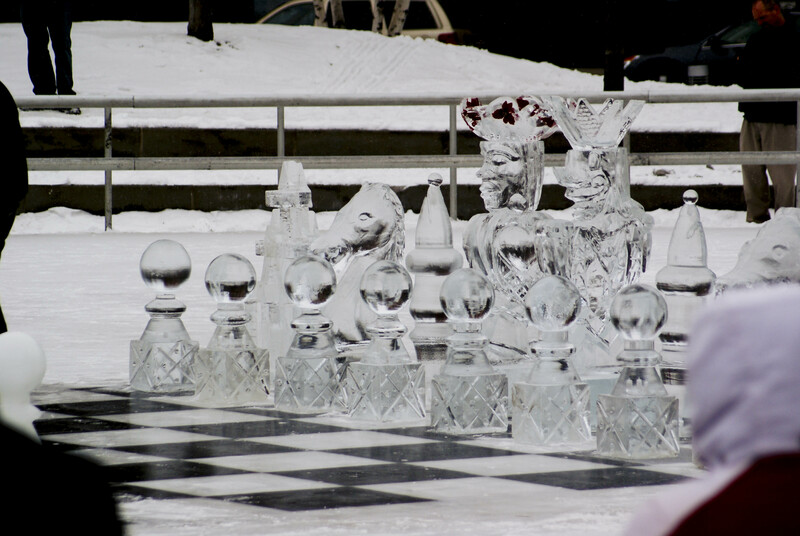 This afternoon at Rosa Park Circle in downtown Grand Rapids they held Ice Battle Chess, which was apparently for a show on the Food Network. I was sure to bring my camera so I could try to take some photos. I got there around noon, which was when the chess was supposed to start. Like a lot of things (especially something this size) it didn't start on time. But that's ok. All the shuffling around setting things up gave me a chance to get some photos in before a crowd really built up. They were just getting started when I had to head back to work. Since they were looking for audience participation, it was just as well. I would be a terrible extra for a TV show since I would likely not participate in most of the antics that look good on the camera. I really just enjoy trying to be a wanna-be ninja (we all know I'm not stealthy) as opposed to drawing attention. Anyway, here's a slideshow of some shots from this afternoon. No ice smashing shots since I left before the game really got going. Yeah, I know, another quasi-World of Warcraft post. But it's what I did today! I spent a bit of time questing and working on a new, and amusing quest-line. With the revamp to all of the older areas from the original World of Warcraft (vanilla), there are a lot of new quests filled with a more engaging storyline and cut scenes. So in this particular series of quests, the Murlocs (who are an enemy that you do fight, and are quite annoying most of the time) are being forced into slavery, and they need help. So I just created a little slideshow of the various quests. 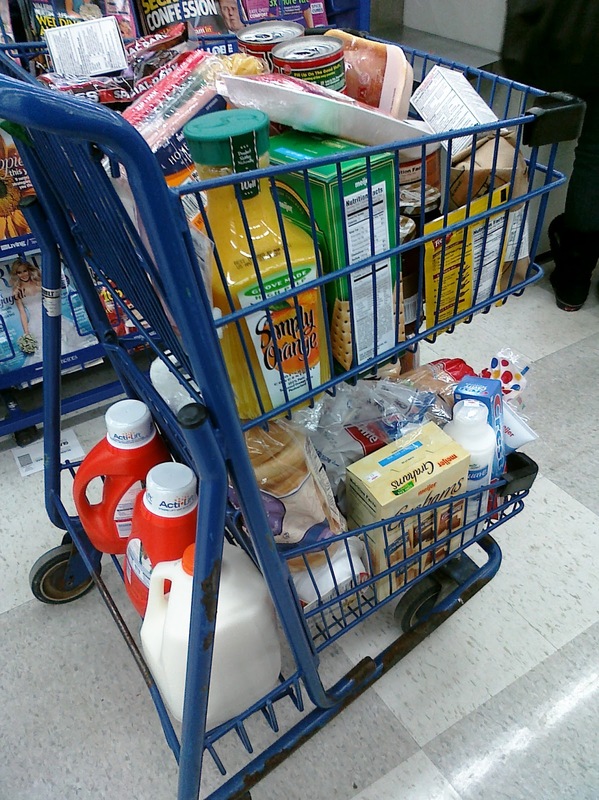 Aside from gaming, Chris and I did serious amount of grocery shopping. Lots of things were getting low, which meant we had to pick up lots of supplies. I don't enjoy shopping, so I spent a lot of this session trying to amuse myself with a tetris game involving the contents of the cart. It makes shopping tolerable. 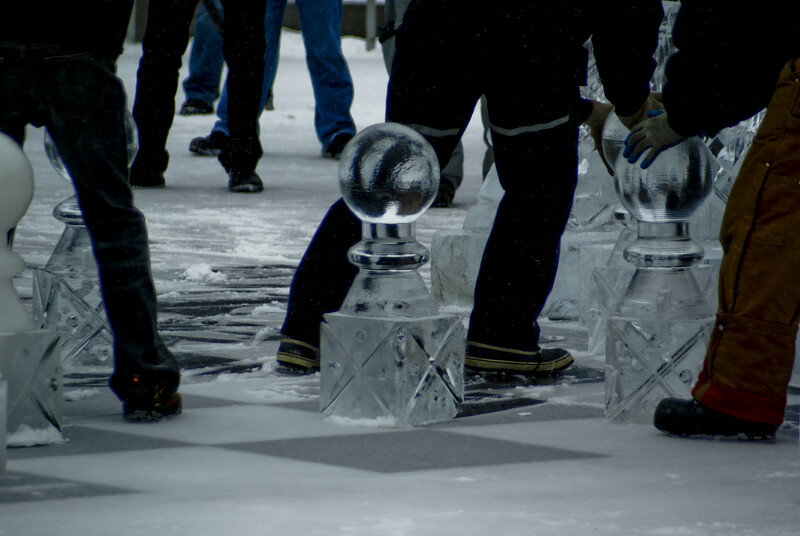 Today was Rockford's Second Annual Ice Festival. Unsure of what to expect in terms of size, Chris and I decided to take a quick drive up and check it out. 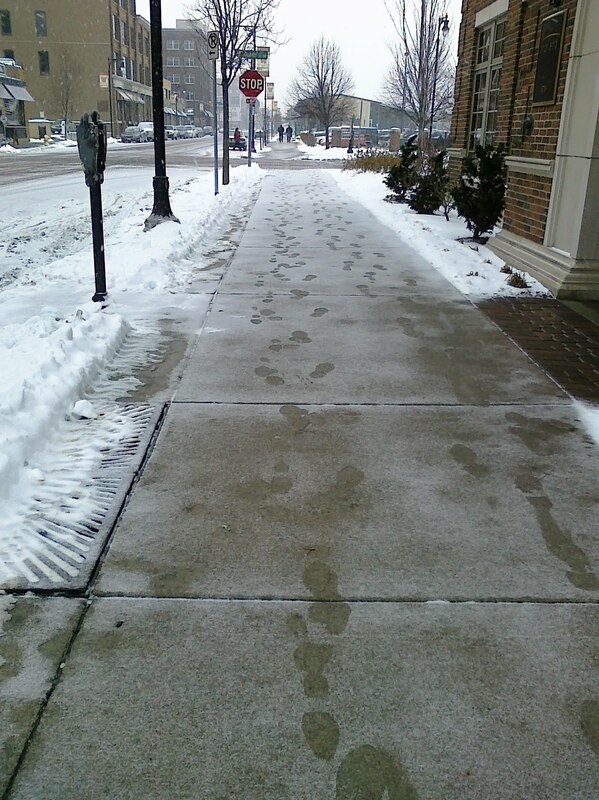 There were a fair number of people in downtown Rockford, armed with steaming cups of coffee and hot chocolate. The sculptures were sprinkled about downtown, though being short I had difficulty seeing over any display that had more than a row of children crowded around it. It was good to get out and check it out. I'm a little bummed that both this event and the one in Holland were going on today but not tomorrow. Maybe next year we'll check out the Holland one. 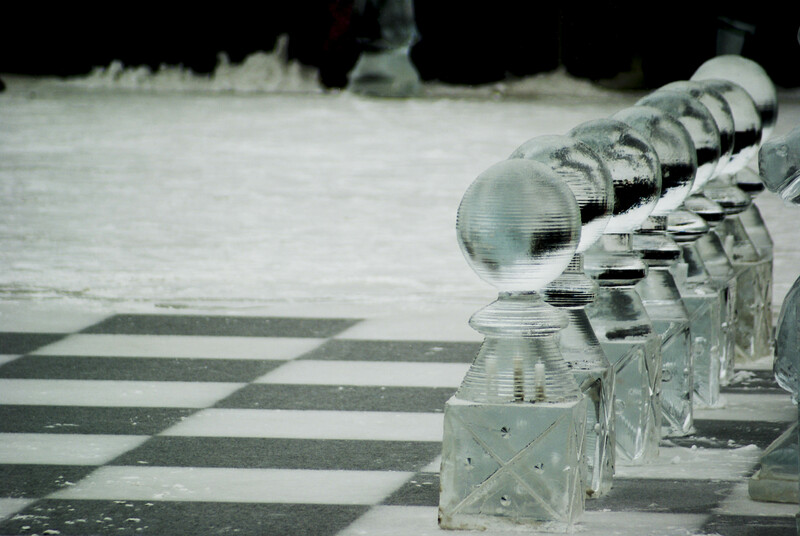 Here's a slideshow of some Rockford Ice Festival shots. Plus, Chris has some video of the event! 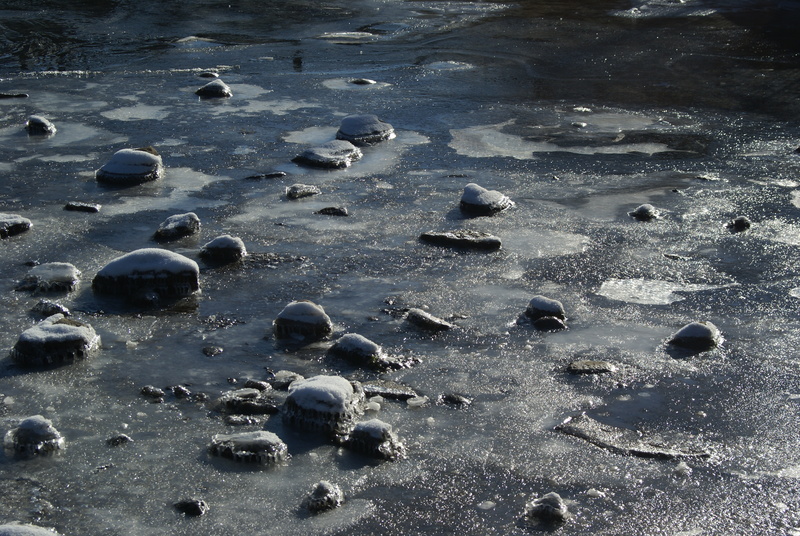 I also spent a fair amount of time just trying to take photographs of nature. Admittedly that's difficult in the midst of a festival, but with Rockford Dam right there, full of ice and snow, I had to try. I did get a few shots that came out decent. I met Lori, as is our tradition on Friday, for lunch downtown. We decided to try Taco Boy since there's a new one that just opened up downtown. Lunch was tasty, and the Lori and I had a good time catching up now that the holiday's are over. 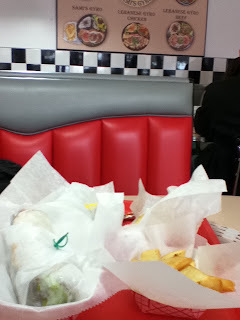 And no, that's not a photo of Taco Boy. It's close to the new restaurant, but I completely forgot to take a shot of place when I got there. So here's the holiday tree outside of the Grand Rapids Art Museum next to the skating rink. 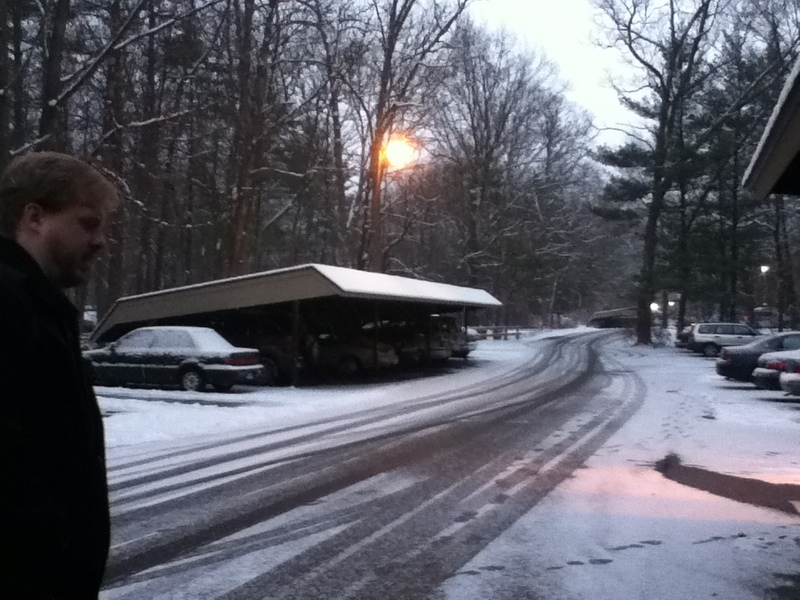 Really I was trying to get snowfall but it didn't appear to show up on the ipod touch photo. There's a lake effect warning for the area from today until Friday night or Saturday morning. That means most of the time when I peered out the windows at work it looked like someone had shook a snowglobe. 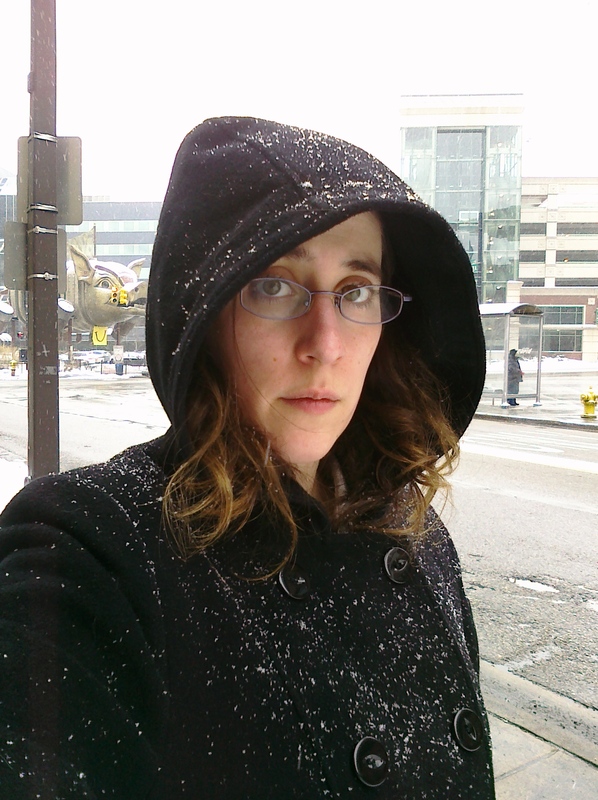 Of course, stepping outside for lunch or after work I was lucky enough to catch a pause between snowfalls. I was just chilling, minding my own business at the computer when a visitor stopped by. If your curious about the video I had up on the monitor - it was in response to this article I was reading. Amusing short video. It didn't snow much at all while we were off for four days. I kept waiting and waiting for snow to do get some decent photos built up for later photo comparisons. No dice. 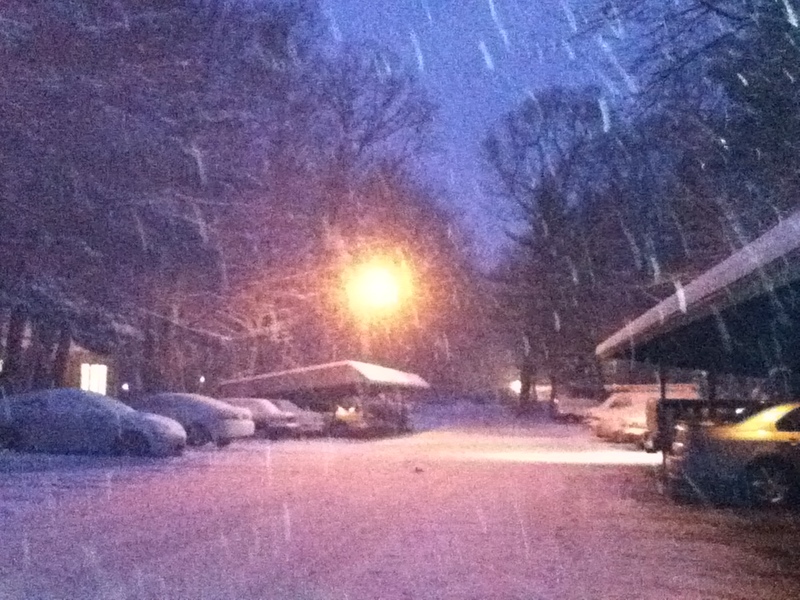 It didn't start snowing until late Monday night and through Tuesday. I suppose I could have taken my camera downtown, but the nature-scenery is a little more sparse and very few buildings work well as a comparison to Middle-Earth architecture. Still, with the new tires the car handled better and fresh snowfall is always pretty to look at. Today was the next busiest day in this four day weekend. Not that that is saying much. We ran up to the post office and then spent several hours doing an epic amount of laundry (8 loads...). 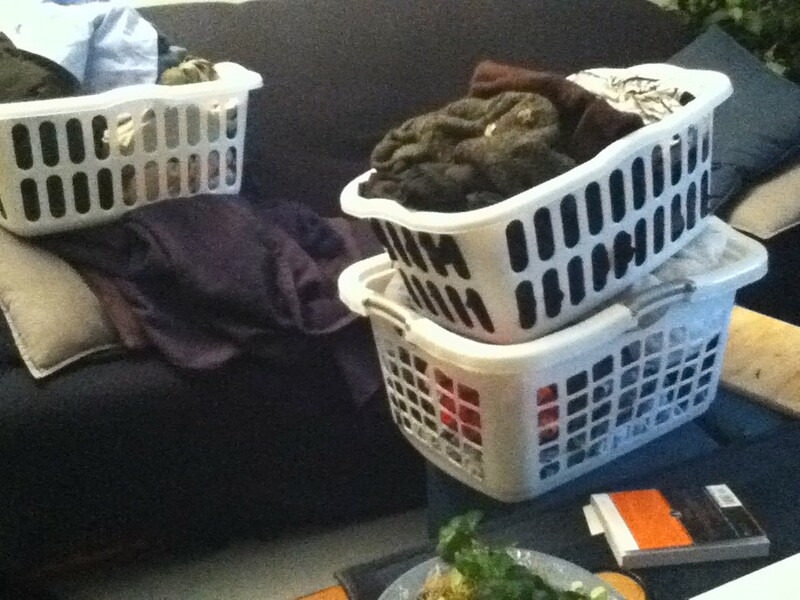 And when I say we, I really mean it was mostly Chris doing the laundry. I hung out at the laundromat and read. In the evening he took down the xmas tree and few decorations around the apartment. Leki was ready to help, as he always is when chang is about.